It was a last minute U-turn that saved Tomohiro Naito’s life. Casting a wary eye on the traffic snarl blocking the road ahead, he flipped his car into reverse and spun around. That decision, he says, could only have been made with the Holy Spirit’s guidance. The road was packed with panicked people fleeing the oncoming tsunami—a collapsed bridge making escape all the more difficult. But, because he chose to drive in the other direction, Pastor Naito missed the crushing wall of water that forever changed this part of Japan. The March 11 tsunami—spawned by a powerful 9.0 earthquake–washed away his church, all of the homes in the immediate area, and the lives of 100 friends and neighbors. On the six-month anniversary of the disaster, the pastor and his wife, Nozomi, take me to that spot on Gamo Beach. I was there to understand and to record the moment. They were there to praise God for sparing them and sparking new strength. Tomohiro and Nozomi point out where their church once stood. Most of the wreckage has been cleared away. All that remains are bricks that once served as the sanctuary’s foyer. The powerful symbolism doesn’t escape residents of this part of Sendai. Thousands have been drawn to the cross in the tragic months since March 11—some seeking hope, some expressing anger, some voicing praise. “We want to keep the cross here as a memorial,” says Nozomi. Her husband seems preoccupied, standing alone in the ruins and looking to the horizon. “Do you want to see the shore?” he asks. After driving a few feet over a rugged, unwalkable patch, Tomohiro puts the car in park. I am about to step onto sacred ground. I have read about and reported on the tsunami. I will now walk one of the beaches that bore its fury. As we step out of the car, Nozomi offers me a face mask and apologizes: “The smell. It is hard to bear.” At first I recoil, imagining rotting flesh, but she corrects me. “No. Not bodies—at least not now. No, this smell is raw sewage.” Since a treatment plant was destroyed during the earthquake, waste is trickling directly into the ocean. “This used to be a beautiful beach,” Tomohiro says sadly, looking at scattered debris. “We used to come to the beach for singing and worship and prayer,” says Nozomi. I mutely attempt to snap photos, fighting the tears blurring my shots. Our time on the beach has ended. We decide to visit the coffeehouse that now serves as the sanctuary for Seaside Bible Church. On the way there, Tomohiro and Nozomi show me a few landmarks. A group of people who met at a designated safe area behind a row of trees were killed. Settling down in the cozy shop/sanctuary for the rest of the interview, Tomohiro and his wife tell me how they met each other—and how they met Christ. “We have been married for 28 years and have two sons,” says Nozomi. The oldest is 27. At the time he accepted Christ, Tomohiro made a commitment to evangelize. “Faith and evangelism are the same thing to me,” he says. He enrolled in Bible College immediately. “Many people came to the Lord at my mother’s funeral,” Nozomi recalls. A few years later, each widower happened to travel to Israel on the same tour. The fathers got together and prayed about spouses for their respective children while at the Western Wall. Not long after, Nozomi and Tomohiro were married. When the tsunami came, she made sure to grab her Bible before running out of the house. “I knew I wouldn’t be coming home any time soon,” she says, clutching her treasure to her chest. Then, tucked inside the pages of her Bible, she noticed a slip of paper. Tomohiro had written a note to his wife, to give her courage in the days after the disaster. “I have told you these things, so that in me you may have peace. In this world you will have trouble. But take heart! I have overcome the world,” (John 16:33). As time slips away, the couple inquire about the health of Billy Graham. Each has a connection: Nozomi’s parents attended the Billy Graham Tokyo Crusade in 1967. Tomohiro attended the 1980 Crusade in Tokyo. “My brother and I even made up a song about Billy Graham preaching,” Nozomi remembers with a fond laugh. 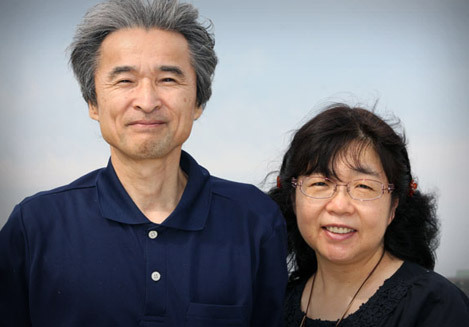 “We look forward to the son preaching here,” says Tomohiro. View photo gallery on left hand side of the page, under the video. Follow the Steps to Peace online to learn about Jesus or recommit your life to Him.